Under the slogan “We are all Lucia. Patriarchal justice is impunity, ” thousands of women marched to Plaza de Mayo to claim justice for Lucía Pérez, who was found dead in Mar del Plata in October 2016. Those accused of femicide and sexual abuse were acquitted at the end of November. In opposition to this ruling, the demonstration occupied more than two city blocks. “Justice for Lucia / we march for life not femicide / not one less / we want to live”, was the chant that became louder and louder in the minutes before six o’clock, when thousands of women began the mobilization . Marta Montero, Lucia’s mother, along with her son Matías, came especially from Mar del Plata, where there was also a mobilization in which Father Guillermo participated, to make his claim heard before the Courts, the point where the concentration began. 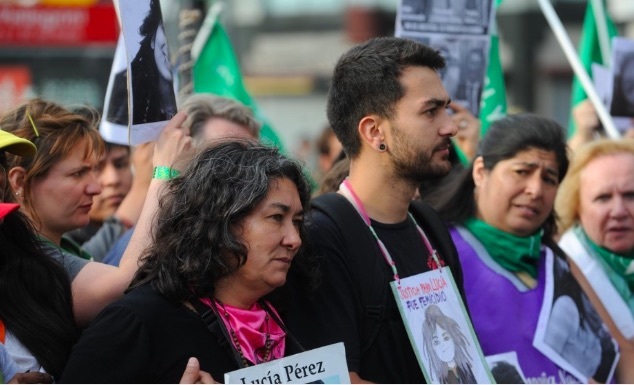 The young man, who cried during several moments of the march, had in his hands a portrait of his sister with the words: “Justice for Lucia: it was a femicide.” Her death, in 2016, had prompted the first national strike of women. “Not one less, we want to live”, was one of the chants of the march, which stopped at Diagonal Norte and Cerrito so that the more than one hundred women who headed the march that reached Plaza de Mayo could lie down, as if dead, on the asphalt. With photos of Lucía Pérez, women of all ages demanded Justice: from a little girl who is no more than 3 years old to Nelly Minyersky, historical reference of the National Campaign for the Right to Legal, Safe and Free Abortion, who has already passed 80. “Feminism is going to win, patriarchy is going to fall, it is going to fall”, was the cry that generated tears in some of the girls lying down on the pavement.